Happy Wednesday/Monday! 🙂 What a drag it is coming back from a long weekend and a vacation. We just got back from the Greenbrier last night and it’s difficult getting settled back in to the workday grind. I hope everyone had a fun and safe holiday weekend. If you caught some of my stories from the weekend, then you are well aware how amazing of a time we had at the Greenbrier. It was the perfect resort for Drew and I because there was always something to do and the food was delicious. Not to mention, the Greenbrier Classic tournament rounds started on Monday so Drew got to check out some of his favorite golfers. I was happy simply admiring all the amazing decor of the resort – it was a complete dream and definitely a weekend for the books. 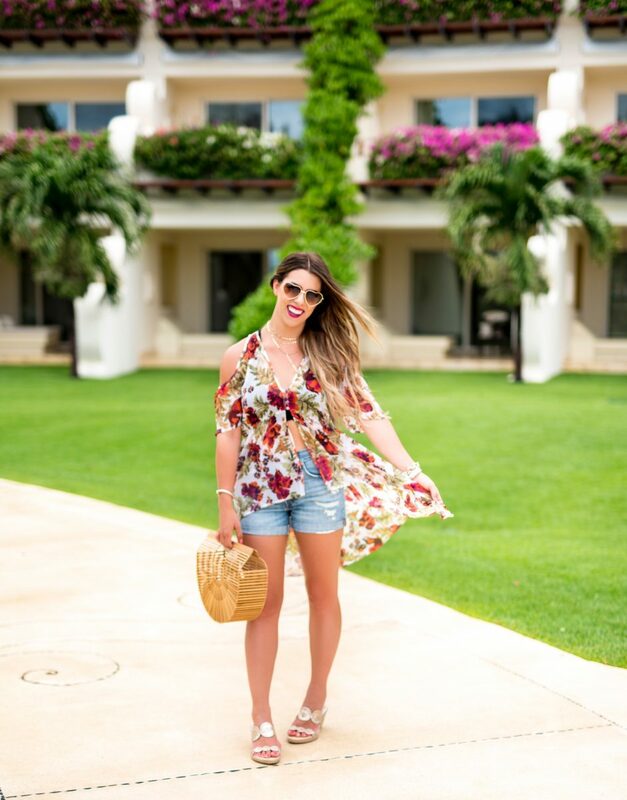 On another note, I wanted to share my last and final outfit with you from m blogger trip to Mexico. I wore this boho outfit to lunch while also touring around the resort. It was perfectly lightweight for the heat and humidity of Mexico. Also! If you haven’t invested in a bralette yet to wear under clothing, this is the perfect one. It fits amazing, and looks super cute under white tees and see through tops. I definitely recommend! P.S. Drew took over my blog on Monday for my blogger series and is talking all about photography. This was a much requested post from you all, so visit the post HERE to read. You won’t want to miss it. Xoxo. Guide to the Best July 4th Sales!